Who watches The Walking Dead? 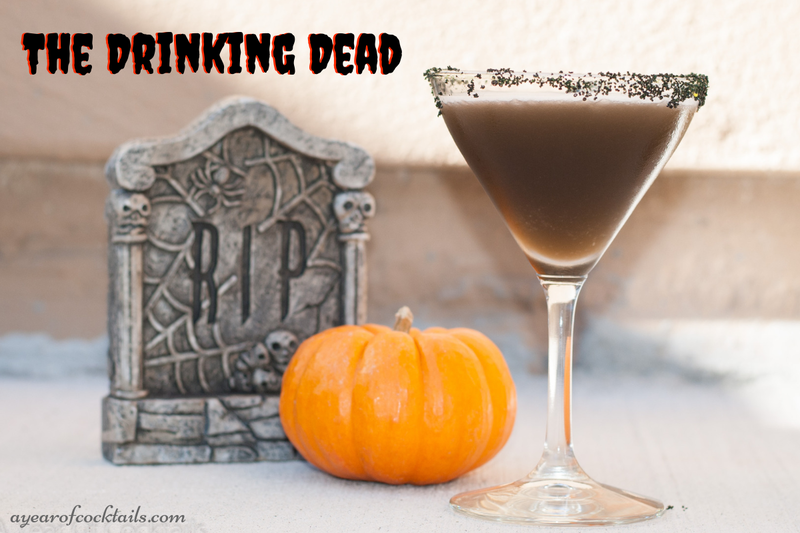 The Drinking Dead is a perfect Halloween cocktail that is delicious in flavor but looks a bit scary in color to drink. OK, so I don't watch the Walking Dead (insert gasp here). My husband does and just about everyone else in the world seems to.....except me. When it came to naming this cocktail, I drew a blank. One of my daughters (who will be the pink dino ranger for Halloween......even thought she's never seen the show.....but thinks her gun is cool, therefore that's what she'll be) came into my office to help me name it, she had a few suggestions and together we came up with The Drinking Dead. So, Thank You my Pink Dino Ranger for helping mommy name tonight's cocktail!! The week before Halloween around here is usually insane. It's filled with costume planning, last minute tweeks to costumes, Trick-or-Treat planning, Haunted "Garage" set up (my son and his friend did an AWESOME Haunted Garage/Driveway/Front Yard last year and they're doing it again this year), candy buying.......then doubting I have enough......then purchasing more, Halloween party planning (yeay it's on a Saturday this year!!). Through all of that (and more that I know I'm totally forgetting), I wanted to make a couple cocktails this week to share. I am happy to say that tonight's cocktail is #2 of the week and that makes me happy! The color might not look fantastic, but hey it's a Halloween cocktail.......it's not supposed to. The taste though, cha-ching winner!! Although it doesn't look like it, you can taste the pineapple juice in this cocktail which is a nice surprise! I really like this one and know you will too! If you do have a bottle of black vodka at home and decide to try this cocktail, please let me know! I'd love to hear what you think! In a shaker filled half way with ice, pour in all three of your ingredients. Shake up this cocktail really well to get some foam. Strain into a martini glass and once it's all in the glass shake the shaker up and down to get the foam to drip in. Here's to Halloween going as smoothly as possible!! I hope you all have a fun and safe night!! Wow you had me at vodka, Chambord and Pineapple Juice.........Oh did I mention the White Chocolate Raspberry Kiss? Decisions, decisions! Thank you for sharing with the Clever Chicks Blog Hop! I hope you’ll join us again next week!